Green & Gold Saran Wrap Manicure - Polish This! With those half pearls I showed you earlier, I also received one BK nail polish to try from Born Pretty Store. I've been seeing these BK polishes recently in many blogs, so I wanted to try one out to see if the quality would be any good. I have the swatches of the polish in the end of this post, but first I want to show you the saran wrap manicure that I did using this Emeral Green Silver Shimmer polish and OPI GoldenEye. I really like to make these saran wrap manicures. They are soooo easy and they also pretty much always end up looking really good! I loved this combo too, I think the gold and green worked really well together and the combination didn't even remind me of Christmas. I was a bit afraid it would as gold and green together tend to do that, but I think the shade of the green and also the gold aren't that chritmassy. GoldenEye worked really nicely with this technique and I really loved how it looks over the emerald green! I probably should have taped my cuticles beforehand, as it is quite impossible to get those gold shimmer particles cleaned around the nails and with this technique there's usually at least little something to clean up. But other than that, I really enjoyed this mani! I have to say that I was really pleasantly surprised by this! The quality was really great and I didn't have any problems with applying or anything. This could also easily be a one-coater, though I did two coats here just in case. I also really like the color! I tried to choose a color that I wouldn't already have in my stash and I think I succeeded. So honestly, I don't have anything bad to say about this one, it's really a great polish! 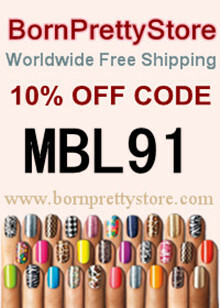 Don't forget that if you want to order this polish or anything else from Born Pretty Store, you can use the code MBL91 to get 10% off from anything. Oh wow these look lovely together! I think the gold really makes the saran wrap manis POP! i love the gold colour! It's really a gorgeous gold! I'm gonna need to grab that green on my next BPS purchase :D It's gorgeous! I really love how these look! It looks a lot like turquoise stones to me! :) Very beautiful! WOW! This is such an awesome manicure!